Dispatching the “SBX” out to sea sends “a very clear strategic message of deterrence to the ICBM threat of the North Korean leader that has intensified since first announced on Jan. 1,” said Riki Ellison, chairman of the Missile Defense Advocacy Alliance, a Virginia-based nonprofit that advocates a strong U.S. missile defense. Media sources reported that the SBX was being sent about 2,000 miles northwest of Hawaii to watch for a possible North Korean launch in coming months. 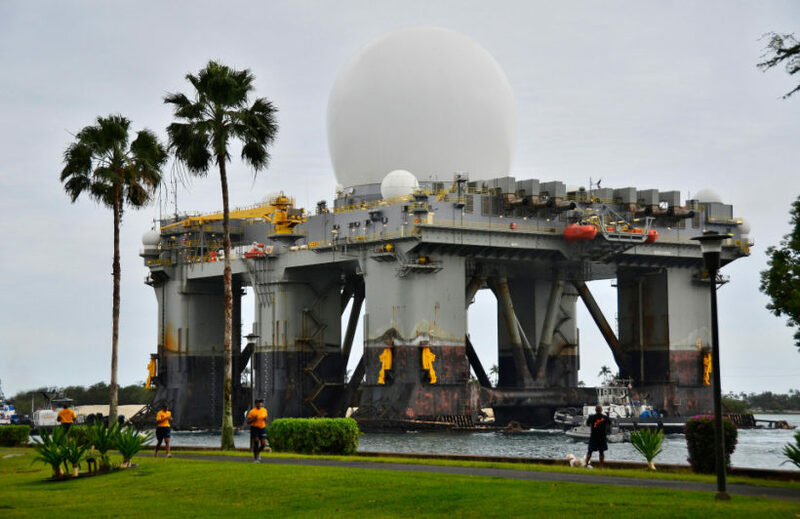 The Pentagon downplayed the floating radar’s Monday departure. “The SBX’s current deployment is not based on any credible threat; however, we cannot discuss specifics for this particular mission while it is underway,” Navy Cmdr. Gary Ross, a Defense Department spokesman, said in an email. Kim Jong Un said in a Jan. 1 speech that North Korea was prepping for an ICBM test launch. “The SBX deployed in the Pacific Ocean enhances and boosts the probability of kill for each of the current 37 and soon to be 44 (ground-based interceptors) in both Alaska and California, if fired at a North Korean ICBM,” Ellison said Thursday in an MDAA release. If the North Korean test ICBM does not target U.S. or allied territory, the SBX would be in a position “to collect invaluable precision data on the warhead and debris of a North Korean ICBM test-flying in space,” the release said. Defense Secretary Ash Carter also suggested this week that the United States might just monitor the launch if it didn’t appear to be a threat. Both the White House and State Department have said that North Korea hasn’t yet demonstrated the ability to miniaturize a nuclear warhead and put it on an ICBM. “But we do know that he (Kim) continues to want to have those capabilities” and that his programs “continue to march in that direction,” State Department spokesman John Kirby said Jan. 3. South Korean media previously reported that the SBX radar was deployed in late September to an area off the Korean Peninsula. Concerns over North Korea’s nuclear program led to the deployment of the SBX in 2009 and 2013, according to the Union of Concerned Scientists. Based on shortcomings of the SBX, the U.S. Department of Defense’s Missile Defense Agency announced plans to develop by 2020 a long-range discrimination radar in Alaska, the scientific group said. “North Korea most likely wants to demonstrate through this (upcoming) test its warhead design and the re-entry capability of a successful ICBM launch in order to validate its strategic nuclear force,” Ellison said. Reprinted here for educational purposes only. May not be reproduced on other websites without permission from Honolulu Star-Advertiser.